Trouble viewing the slideshow? View on Flickr instead. Seabourn is well known for its iconic Caviar In The Surf. Shoreside, staff, some clad in tuxedos, plunge into the water and invite guests to wade in for iced champagne and caviar at a surfboard bar. The lavish event often includes a barbecue lunch, watersports, music and time to soak up the sun on a white-sandy beach. The Antarctic waters are far too chilly to have waiters (or guests) wading in the sea water, however, so what we experienced on Seabourn Quest during one day of our extraordinary voyage to the White Continent was Caviar on The Sun Deck. As you can see from the accompanying photo, though, there was more snow than sun on deck. Earlier, the weather had looked promising for an afternoon event outdoors, but when I emerged onto the Sun Deck, flakes of snow were falling. Rather than dampen the mood, however, the snow vivified the experience. The delicate white flakes added to the festive feeling aboard Seabourn Quest as champagne and caviar were served, at no charge, on an afternoon that followed a morning of spectacular landings. Maybe Seabourn is on to something new, Caviar on The Snow Deck. If you haven’t seen the series Antarctica Explored, A Photo A Day, you can catch up by clicking here. 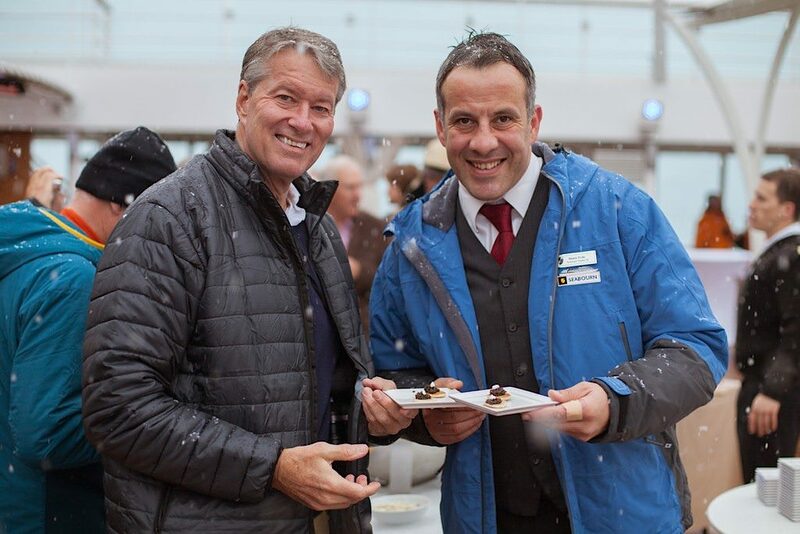 Caviar on the sun deck: Ralph Grizzle with Seabourn Quest Assistant Maitre’d Damir Pedic, cruising Antarctica this past December. © 2014 Yuriy Rzhemovskiy for Avid Travel Media Inc.